Rage Modding Tools Arriving "Real Soon Now"
id Software's John Carmack thinks that the company has "made poor decisions on this all year". Anyone out there still playing Rage? Some people are still showing some interest in id Software's post-apocalyptic shooter, with one of them asking co-founder John Carmack when we can expect to see mod tools for the game. According to the man himself, it looks like the tools may finally be making an appearance. A potential Rage modder sent a tweet to the game architect asking on the progress of the tools, describing the year-long wait as "getting a bit depressing". 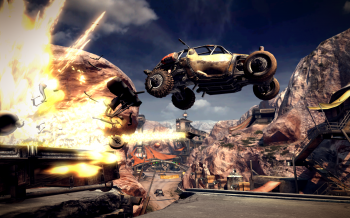 Prior to the game's release, id's creative director Tim Willits stated that Rage would come shipped with modding tools out of the box. The original intention was that users would simply enter 'id studio' into the game's console, and they would have access to the same toolkit used by the developers. Alas, it was not the case. Carmack explained that the company's work on Doom 3: BFG Edition had delayed work on the tools, but he reassured that modding capability would be coming eventually. "BFG work pushed the Rage tools, but Real Soon Now. I hope. Sigh. I think we have made poor decisions on this all year," he said.